I love seeing fabric around the house, and I love making useful things out of fabric. 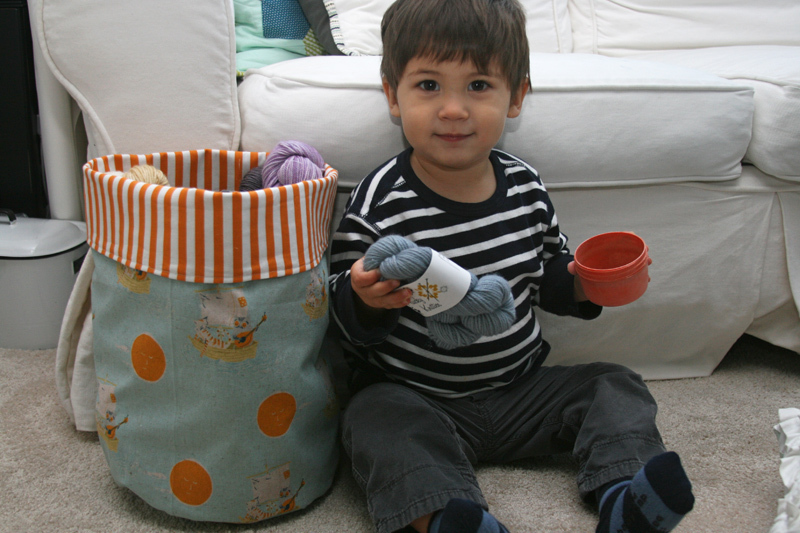 Luckily these round bottomed storage buckets hit both points! Max seems to be amassing lots of collections of various types of toys these days, and as much as I try to keep them all organized, somehow I’m still always tripping over a matchbox car or lego piece. But I’m hoping that having places to put these toys will lessen the number of times this happens (a girl can hope, right?). Of course, toys aren’t the only thing you could store here – they’d also be good for knitting supplies, fabric scraps, hats & mittens, um… a pretty covering for a potted plant? Whatever you want! And of course, since not everyone has use for this small size, I’ve also provided measurements for a larger version, perfect for storing yarn (I have 15 skeins in the one shown above), or anything else you can think of! Want to make some of your own? Let’s get going! The small size has a finished base of 6″, with a height of about 10″ (with the top unfolded). 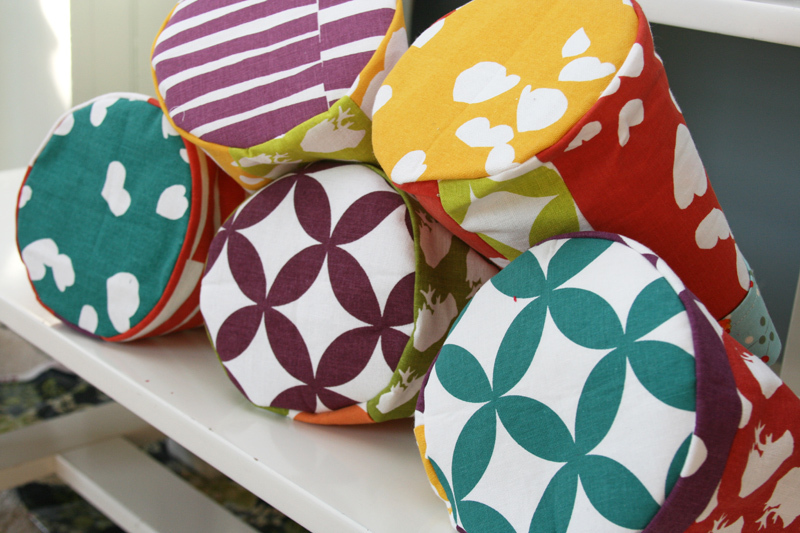 If you use a contrasting fabric for the circular base, this is a great project to use up fat quarters! The large size has a finished base of 10″, with a height of just over 16″, and can be made using a 1/2 yard of fabric for the outside, and 1/2 yard for the lining. I recommend a heavyweight fabric for the outside, which will give your bucket more structure – home dec, canvas, a cotton/linen blend would be appropriate. I like to use a quilting weight cotton for the lining. The interfacing is optional, depending on how sturdy you want your bucket to be. For the small buckets shown in the photo above, I used a heavyweight canvas fabric for the outside, and felt it was heavy enough to forgo the interfacing. For the bucket shown in the tutorial photos, I used a heavier fusible interfacing to give the linen/cotton blend outer fabric a bit more structure. Cut your fabrics to size, and, if using interfacing, follow manufacturer’s instructions to fuse the interfacing to the wrong side of your outer fabrics. 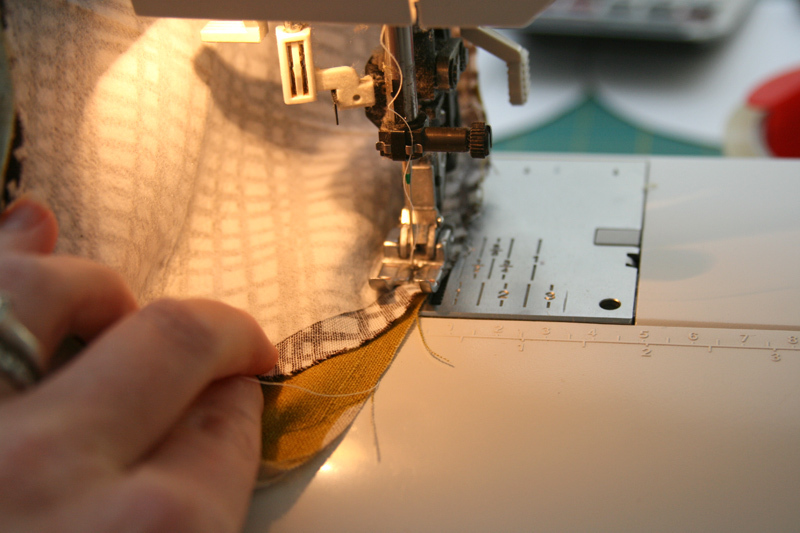 Sew the short sides of your main outer fabric together, right sides together and iron seam open. Iron crease marks at the base of your main fabric, first in half and then in quarters. Do the same with your circle, folding it in half and then in quarters, and iron so you’ll have markings. Using these markings, match up the markings on the base with the markings on your main fabric and pin at these points. Then ease in the fabric between each marking and pin. Sew the base to your main fabric. I like to sew with the base on top, sewing slowly and using the needle down feature. 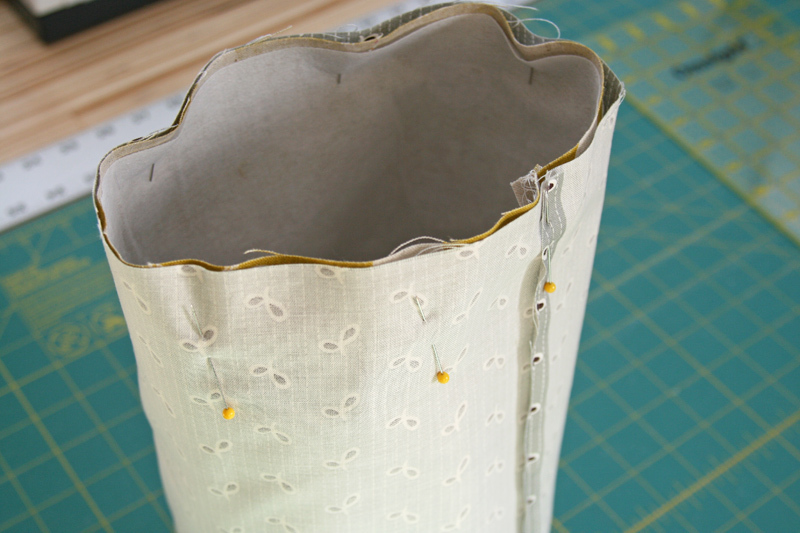 Once you’ve sewn the base, flip your bucket right side out, and repeat the above steps to sew the lining. Leave the lining inside out, and slip the outer bucket piece into the lining piece (the right sides of your fabrics will be facing). Align the top edge and pin along the perimeter. Sew along this edge, leaving a space about 3-4″ long open for turning. Pull your bag through this opening and fit the lining into the main bag. Iron this top edge, tucking the open edge down. Topstitch along this edge, closing the opening at the same time. 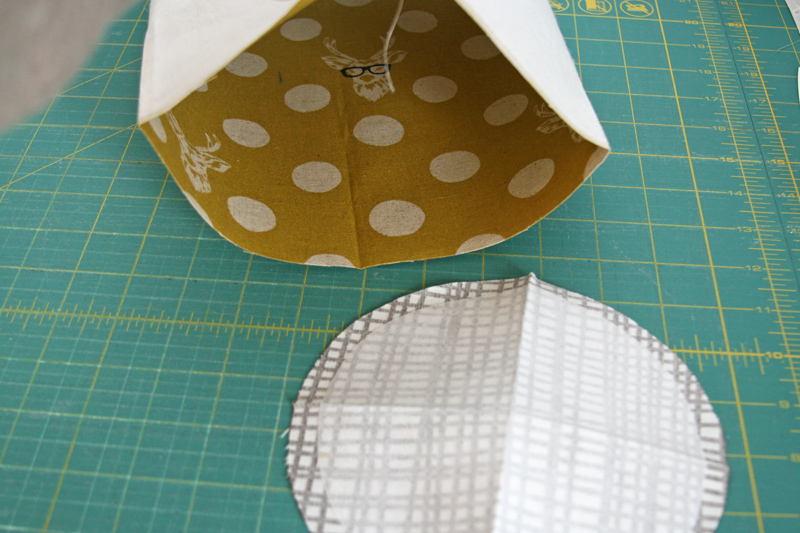 Fold down the top edge so you get a peek at the lining and fill with whatever you’d like! For those who asked previously, the fabrics shown in the first photo are handprinted in Japan, and were purchased from Kalla Design (though unfortunately it looks like she only has one or two items listed currently). This entry was posted in Tutorials and tagged fabric bucket, handmade, round bottom fabric bucket, storage buckets, tutorial. Bookmark the permalink. Can you please tell me what type or weight of interfacing you used as we do not have a wide range here in Australia. Also do I have your permission to share this project with my sewing group to make as a Christmas swap. I love your funky quilts and ideas. is what I use here pellon makes one craft wt that will work, sorry I don’t know the number, they changed the numbers from when I bought the one I have and what is available now, same stuff tho. Thank you soo much for this terrific tutorial. I’m hoping for some flurries tomorrow so i can squirrel myself away and sew a few of those good boys (see what I did there bad boys ~good boys, gee i’m clever ) Thanks again , Ashley you never fail to inspire me. oh yeah, cute wee guy too…mine are so big now it’s hard to remember them that cute, although they were. Thanks for the great tutorial! I might have to make some of these tonight. Awesome! Thank you Ashley. 🙂 I think I have some home dec fabric from Ikea that would work well for these. Love these Ashley!! Making some ASAP. Fantastic idea! It beats using store bags… Thanks for the tutorial! Love your round bottomed bags and thanks so much for the tutorial! thank you for this beautiful and useful project. love containment in my small house. i think we have the same chair. I suppose you can add handles of any length for carrying. Thanks for the tutorial Ashley! I love the shape and the two sizes, and of course you made them with the most adorable fabrics! These are so so good, Ashley!!! Thanks for posting the tutorial! hi! thanks for the pattern. i made one of each of the sizes you have listed… the small one came out perfectly… but the large one seemed to be way off. i checked all of my measurements a few extra times and still couldn’t get the 10.5 inch circle to work- it was simply too small. i ended up having to take a few inches off my main and lining pieces to make it work. 🙁 did anyone else have this problem?? awesome tut! thank you so much. 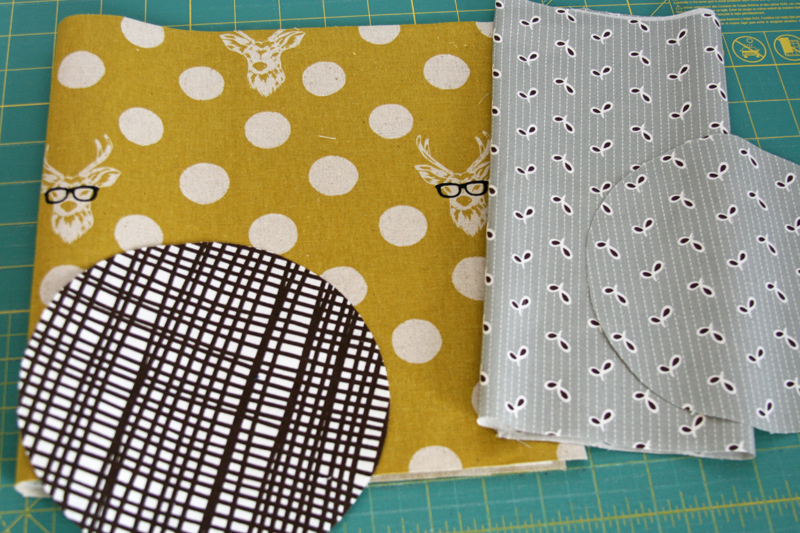 i love the fabric of the deer wearing elvis costello glasses! These look so cute, I want to pull out my sewing machine right now and make one for everyone I know. Thanks for sharing! I’ve just made four of the small baskets – and I am so pleased with them! I have hidden all my dressing table clutter inside them. Thanks Ashley – a great tutorial. I will be making some more and also be attempting the larger version to make my mum a new knitting wool carrier for Christmas. I made the larger one as a hamper for my daughter. it looks great. I did have to increase the diameter of the circle to 11.5 inches. Thank you for noting this! I rechecked the pattern and there was a little error in the sizing. Measurements are correct in the tutorial now. Thank you for this great tutorial. This is exactly what my son has asked me to make him for Christmas! Love them! Just made one for all of my daughter’s hair clips and bands! Thanks for sharing. Great pattern. Thanks for sharing! Just found your blog while wasting a bit of time on pinterest….wow – great ideas, love the tutorials and your quilts are gorgeous! Downloaded the pdf of the string quilt and am planning to go through my stash this weekend and start one. 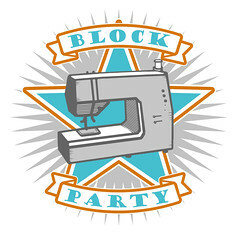 Forwarding your url to my quilting group so they can get inspired as well. Thanks! I found the templates off from the directions when I printed. Great tutorial. Thanks. Will be making some for Christmas. Thanks for the great tutorial; I plan to make a few for xmas gifts (nothing like leaving it to the last minute to decide to make homemade gifts). 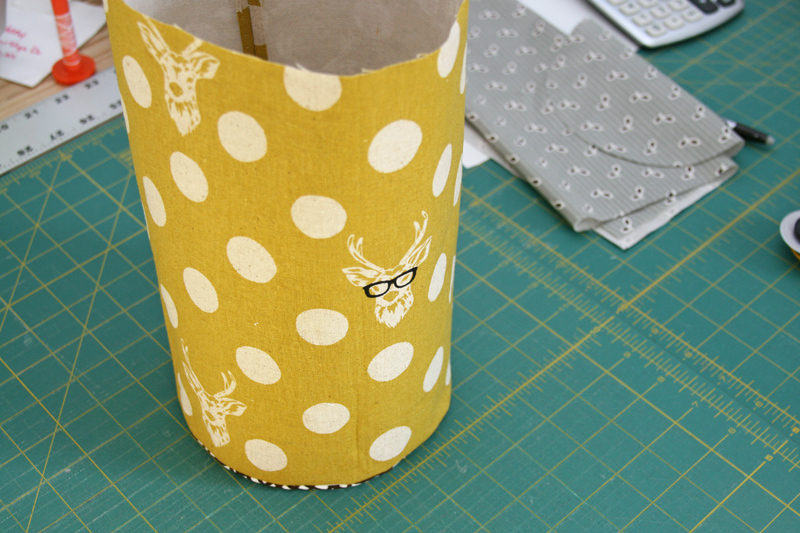 Could you please share the designer/manufacturer of the fabulous yellow deer fabric? I LOVE it! Thanks for the tutorial! This is my first time to your blog, so I’m very happy I found something that worked out so well for me! I just made one, a bit larger, with handles to use as a laundry hamper (for the outside fabric I patchworked together from some partial fat quarters and remnants I had laying around). It came out so pretty and your tutorial was very easy to follow! 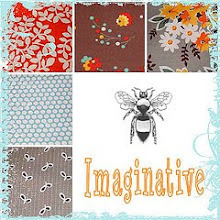 One question-where do you get your fabric? It’s so gosh-darn cute! And I love the way you paired the different fabrics together. Love these.. but a bit confused.. before i begin.. are the measurements now correct for circle diameter.. 10.5 or 11.5? Really appreciate your time in responding.. making these as soon as i know for sure . How do you keep the basket from collapsing? Is it the fabric you are using? I have not attempted to make this yet but I was just wondering. Love the idea. Thanks for the great tutorial!! I’m new to sewing and appreciated the easy-to-follow directions. I made two small buckets this weekend and they are so cute! Pingback: Blue Nickel Studios » Blog Archive » Happy New Year!! I made one of each size bucket and love them. Took it a step further with a third bucket cutting fabric 18″wide X 7″ high.. circle 6″ diameter…super cute.. Thank you so much for this tutorial! Awesome tutorial, just made the large one. I’m addicted, I’ll be making lots more. Thanks so much for taking the time to creating this tutorial. Awesome tutorial! I had to play a bit with it ‘cuz i used sew on interfacing (my first time using it) instead of iron on. Usually, I make a point of not using materials with adhesives because of the chemicals and fumes involved. Regardless, the tutorial is great. I am making lots of this ones! Thanks! I LOVE these!!! I’m having a little trouble getting the circle to sew into the bottom without having a pucker when I finish. How big should my seam allowance be when I sew the main piece of fabric together on the short sides? Would that make a difference in how my circles fit at the base? I’m new to sewing so I need all the hints I can get! I love your blog! Your projects always supply me with plenty of inspiration! Just made the big storage bucket tonight for my niece and your tutorial was very easy to follow. Great job! I think this is wonderful. The only thing different that I’m going to do with this is make a drawstring so when we go on out trips all I have to do is grab the bag and go! That’s the easiest explanation of how to put these fabric buckets together that I’ve ever seen. Many thanks! I just made two of the small buckets and they turned out to be really cute. Your tutorial was very easy to follow although I missed some information about the seam allowance. And I had to convert the sizes from inches to cm (I’m German). Nevertheless, I had no problems and I’m still new to sewing. Therefore, I can really recommend this tutorial to beginners. Thank you for posting this tutorial! I enlarged mine and added handles–I think it turned out great! I totally get the LEGOs… my son is about the same age as your cute Max. By the way, I love your fabric combinations! Just found you, can’t wait to make these!! So cute!! I look forward to reading through your blog!! Thank you for this fantastic tutorial. I have just made a small one from a retro pillowcase and it looks great! I am putting together sewing “baskets” for my 10 granddaughters for Christmas this year, and this is perfect for the basket. Thank you. 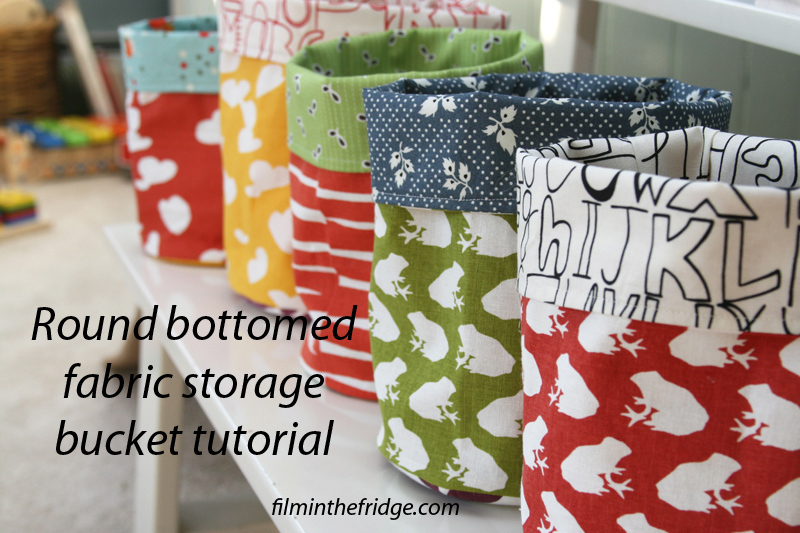 What a great idea and a great fabric lover’s storage unit that fits just about anywhere. I’ve revamping my space and will most certainly make several of these, thanks so much for sharing. Hi! Love this tutorial thanks so much for sharing! Just wondering if I want to play with the sizes how do you calculate the diameter? Thanks for the swell tutorial. 🙂 Very fun project! Love these. Want to make some for my granddaughter’s home( a newlywed). This tutorial is so neat! I love the entire idea. Thank you for sharing! The diameter is the measurement across the center of the circle – edge to edge. The circumference of the circle (outer edge) is what you need to sew to the rectangle (cylinder), which is why the measurement seems so much larger. Please stop by and grab a button to show that you have been featured! I made a bunch of the small ones and they are adorable! However, I just made a large one and did not have enough fabric to make the circle. I took about a 2-3 inch strip of the extra fabric that I had and sewed strips on the part of the circle to complete it. 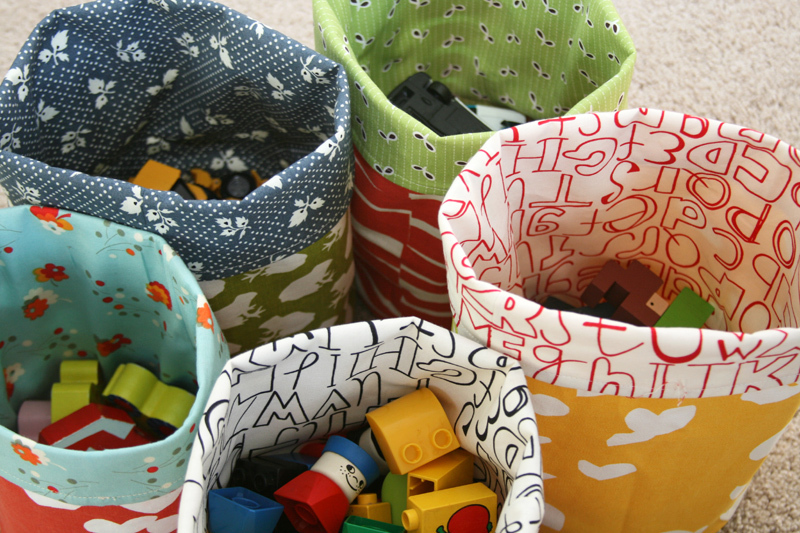 I would buy 3/4 of a yard for the large fabric bins next time. Love your site and thanks for all the great ideas and sewing instructions. I love, love, love these. I went right out and bought fabric to make this. Excellent tutorial! Just found this tutorial and I think it’s awesome! Thanks so much for creating such a fun useful tutorial. I love the baskets, and am trying to make some myself. Anyone have suggestions on how I could do a 2 layer bottom so I can put some weighted beads in it? Is that even possible? Basically I’d like the same design but with one bottom (that would rest on the table), then a couple inches or so of a weight filler, then another bottom that would be the inside of the basket. You could always add a layer of denim or something heavy like that. THANKS so much for this! I have been looking for a DIY alternative to the ‘thirty-one mini utility bin’. I love that bag, but it is pretty expensive! THIS is perfect! Definitely pinned this & will be adding this project to my “to do” list! I love these storage buckets! But, before I begin to sew one, what kind of interfacing would you recommend? Just made the smaller basket….how cute and easy!!! Just LOVE it! Thanks so very much for a GREAT tute!! These are great! Im going make some for our play room and maybe a big one to take to the pool. So cute! The big one would be adorable as a hamper for a kids bedroom! Thank you!! I am wondering what seam allowance to use. I am also having trouble with puckering when I sew the circle to the main part. thanks for posting this tutorial. am very excited to get started. I just noticed though that the template for the smaller circle is not 6 1/6 “, but is just shy of 6 1/4. Am hoping that it will work out anyways! Thank you for sharing this tutorial! I made one of these tonight for a friend. For those asking about seam allowance, 1/4″ allowance should be used through out. If you do wide basting stitches before machine sewing the circle bases, this helps keep everything together and keeps you from getting poked with pins! 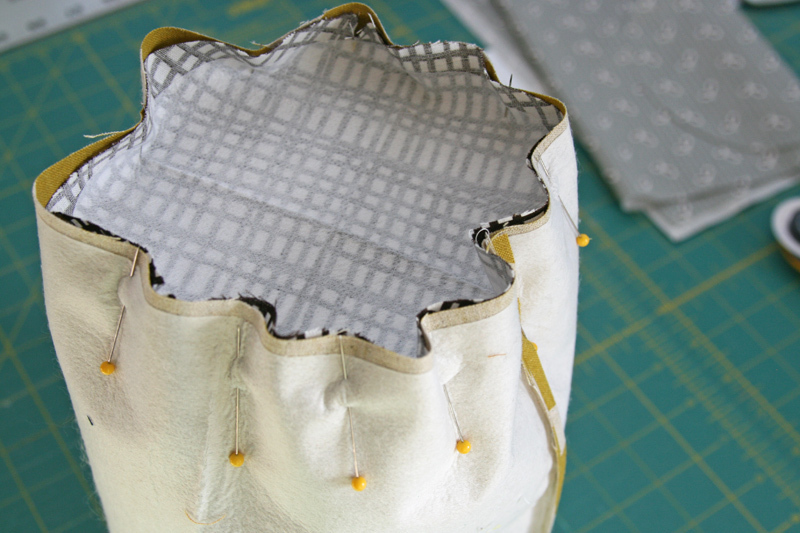 Also use an 1/8″ seam allowance when sewing the finishing stitch around the top at the end (or else you may not close the 3-4″ gap used when you were turning). I am planning to make one for myself now! Loved this quick and easy basket to make! I made the big one in about an hour. So much easier than I would have thought. Thanks Ashley! thank you so much for this! i’m going to give it a try! Thanks for this. Just made a new knitting project bucket. Perfect. I just finished my first fabric bin. It was a fun project and I look forward to making many more. 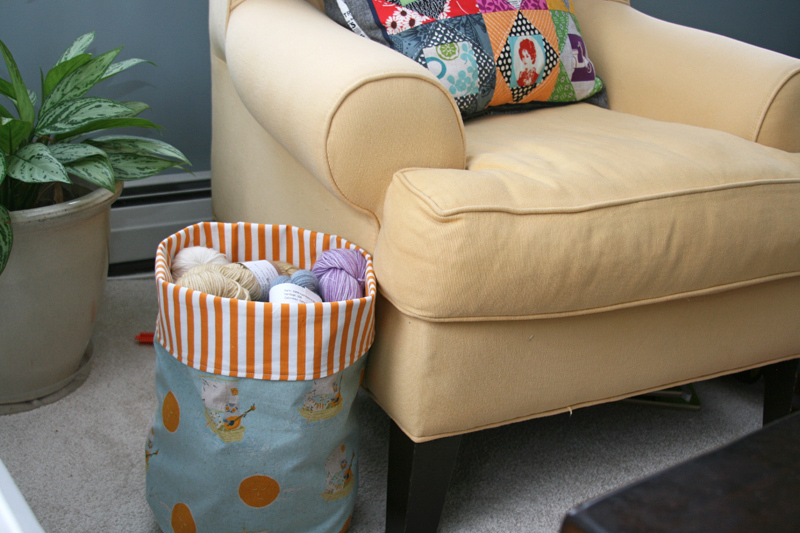 It is a great way to repurpose fabric of all kinds — for many different purposes. This would be a great project for young sewers —- maybe 4H or scouts. Thank You for sharing. This tutorial is great! I’ve just made two baskets and added a loop so I can hang them on the wall to store slippers and they work perfectly. Not to mention they look fantastic. now to make some more for my sister! Pingback: Fabric letters & bucket | get creative…. Hi! Thanks for the great tutorial. All of the instructions seem clear, but I feel uncertain about when to attach the fusible interfacing to the bottom of the bucket. 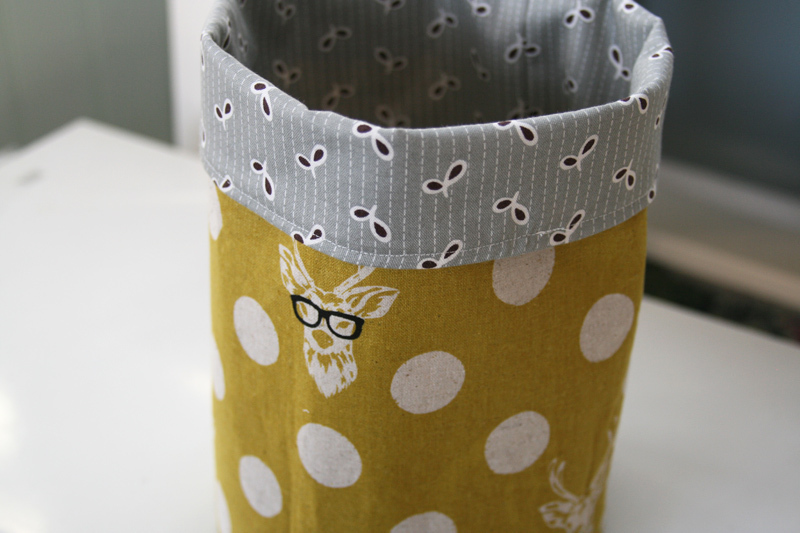 Also, whether I should attach it to the wrong side of the bucket lining or the wrong side of the main (outside) fabric…? Thanks for any insight you may provide! Hi; Just happened on your site. Have made quite a few without the interfacing and one large one with the interfacing. Didn’t cut the interfacing smaller as you said to do. I’m making another large one and have cut the interfacing to your specifications. Just wondering if it is attached to the bottom or the top of the basket. Thank you so much! These are so useful for so many reasons–gifts, storage, just plain cute. Merry Christmas, Ashley! I can’t find a link for either the mini or itty bitty circle PDF only the medium and large. Can you help?